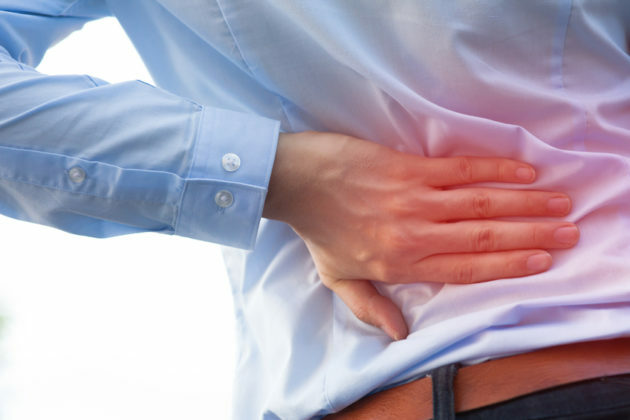 Having back ache is very common especially with adults who spend most of their time working all day. Sitting in front of the computer for 6 to 8 hours a day, field work, standing all day, and other strenuous activities at work can cause back ache. Weightlifting and other exercises at the gym can also cause sore muscles in some body parts including the back area. Other causes could be pregnancy, stress, depression, over fatigue and others. if accompanied by fever and other symptoms aside from back pain, consult a physician immediately. Symptoms depend if the condition is mild or severe. When back problems arise it limits our body movement and makes us feel weak. In times like this, we cannot afford losing a day at work so we sort to over-the-counter medicines for immediate relief. This becomes a pattern and we become fully dependent to OTC medicines which have side effects in the long run. To avoid relying on OTC medicines and to make sure not to suffer from the side effects, there are natural home remedies for back ache that are as effective as the medicines you buy from drugstores. These natural home remedies are effective in soothing your back ache. No need to buy over-the-counter medicines when you have these remedies at home. Ginger is known to contain anti-inflammatory compounds. This herb when boiled as tea can cure many body pains including back ache. If you look closely at some oil-based medicines and liniments you can buy from the store, most of them contain ginger extract. They use it to treat body pains by rubbing the affected area. To make a ginger tea or ginger concoction, just peel off ginger and chop into pieces. Boil 2 cups of water and add the chopped ginger. Turn off the stove when the water changes color and evaporates into half. Let it cool and add a tablespoon of honey. Some people would still use the boiled chopped ginger pieces by chewing off to get the extract left or to rub it on the skin. This can help alleviate back aches because of its analgesic effects. The analgesic compounds of wheat are best combined with coriander and cuscus grass powder mixed with a cup of fresh milk. Make sure to first soak the wheat with water overnight before combining the other ingredients. Just boil at least 10 leaves of basil in a cup of water until the water turns half from evaporation and when the color changes from the basil extract. Let the basil concoction cool a bit then add a dash of salt and stir. Drink this once to twice daily to soothe your aching back and to relax your body. This herb is one of the most always present herbs in our kitchen because this is used for sautéing different kinds of dishes alongside with onion and pepper. But aside from making good and healthy meals, fresh cloves of garlic about 2 to 3 pieces when eaten daily in the morning before breakfast and with empty stomach can treat back ache. This routine can also cure other conditions such as a high cholesterol level, ulcers, gastric problems and more. Ice pack gives instant relief to body pains. If there is no ice pack available at home, you can just crush ice or use iced cubes wrapped in towel then apply the homemade pack to your aching back. You can also use this on head ache, knee injuries, sprain, and swelling. The cooling effect and the ability to contract the muscles when applied to the certain body part help in temporary alleviation of pain. It also helps prevent an injured body part from swelling. Back aches are usually caused by sore muscles. If we have our muscles stronger and agile, we have lesser tendencies to experience back pains. Daily exercise focusing on strengthening muscles will do the trick. Also, exercising by proper way of stretching helps our body to have proper blood circulation and promotes healthy joints and muscles. Doing fitness activities will not only make our back happy but also our whole well-being as we keep ourselves fit and healthy. You can ask a family member to do a slight massage on the aching area by means of rubbing, pressing, and stretching. This helps ease stress on the back and relax your body. If you know someone who does home service massage, you can hire them to do a full body massage. Massage therapists are trained to trigger stress points in your body and alleviate them using different massage strokes, helping you to ease your body pains and at the same time making you feel well and relaxed. Chamomile tea is known to help relax the body and gives you a sound sleep. It helps by soothing up muscles that cause back ache. There are ready made tea packs that you can buy from grocery stores or you can make your own by steeping fresh chamomile flower on a boiling water for about 10 to 12 minutes. Drink this twice to thrice a day and you will feel immediate results. This ancient method of treatment that originated from the Chinese is known to help trigger the points where the pain is produced. By the form of this needle treatment, these points are stimulated that according to them helps put the body back in balance and promotes energy, improved health, and relieved body pain. Back aches are sometimes associated with lack of calcium in our bones. As we age our bones become weak and brittle because of the lack of calcium. Adults, especially women, are prone to bone related diseases like osteoporosis. Bone diseases can cause great pain. Consuming foods that are rich in calcium is very important. That is why drinking milk is important even for adults. Other than milk, sources of calcium include other dairy products like yogurt and cheese. Non-dairy products include sardines, fresh orange juice, leafy greens like kale and spinach. Bread and grains are also rich in calcium. Having back aches can affect our daily activities and work life but treating this condition doesn’t always require store-bought medications. The above mentioned natural remedies are there to make sure that your condition can get better without having to experience the side effects of medicines. More so, these home remedies for back ache can also prevent the condition from taking place. That is why having them always at home is important. If you believe that you back ache is caused by an underlying disease and not just a simple case of back ache from stressful activity, you have to consult a physician immediately to detect the cause do the pain. Sometimes, the body pain that you are experiencing is a sign of a bigger health problem that needs immediate attention and proper medication.